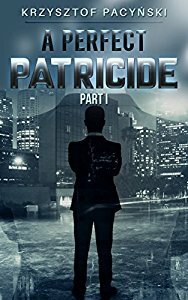 A Perfect Patricide, looks like a wonderful series. How many books total are planned? That’s a tricky one, as I never have a specific outline, so until I actually finish with writing a story everything remains on the table. All I know is I’ll need at least one more book to wrap the story up. What do you think makes a great political thriller? You can (and should) be innovative, while always remembering to retain a sense of plausibility. This is why I’m critical of Netflix’s House of Cards, while loving an original British series. You can almost create your own universe (for example I managed to include an entirely fictional foreign country for a subplot), as long as you retain basic realism and consult your sources, which is especially important when writing about the political process. What inspired you when writing A Perfect Patricide? When I was about 12 years old I’ve stumbled, while scavenging out the school library, upon a collection of short biographies of U.S. Presidents from Washington to Reagan, and been interested in American political history ever since. And, given my early ambitions to become a writer, I always wanted to come up with a story based on what I’ve learned over the years. Eventually post-Civil War South became my favorite subject, which led to writing A Perfect Patricide. Embarrassingly, I’m yet to actually set my foot on the U.S. territory. As a bit of an afterthought I think me, being a Pole might’ve helped me actually understand better my characters and the overall backdrop of the story. Poles and people from the Dixie famously struggles to overcome their complicated history. Maybe for different reasons, but the mechanism is uncannily similar. I hope for writing to become my primarily occupation in life, but I’m wary of ruling out other things to pursue. It came kind of naturally, so I can't pinpoint the exact moment or situation that resulted in me saying "wow, I want to be a writer when I'm older!" Growing up in a household full of books must've played a role here, but the greater credit should go to my late dad, who was also a published author (though he started off relatively late, while in his early 40s), and who was always supportive of me pursuing this dream. When writing A Perfect Patricide did anything stand out as particularly challenging? Aside of not being a native speaker pretty much the same thing I'm always struggling with: getting the story off the ground. I tend to get stuck on the first couple of pages, even paragraphs, before things starts to move smoothly. How did you come up with the story of A Perfect Patricide? It started as some fun I was having with my American friends with similar interests (most being subsequently named in the acknowledgments): each coming up with a fictional politician and his background. Overtime I've became so consumed with the story I could stop focusing in the middle of my university classes when struck with a new idea. Unfortunately, despite some earlier abortive attempts, it took a lot of time to finally gather up courage (and self-discipline) and write a damn book. The best thing about reading (and as Stephen King plainly stated, one can’t write without reading a lot) is you can do it everywhere and every time. Aside of that and caring for my pets I love to drive a bike, walk and swim, which makes autumn/winter harder for me to swallow. Unfortunately, as as a English language reader is concerned, I’ve done most of my writing so far in Polish, but I’m trying to expand my presence on medias such as Twitter and Facebook to accommodate English readers.